Emails authored by FEMA say the head of New York City’s public hospitals proposed to "head off" a critical I-Team news report by signing a "mocked-up" agreement on Sandy disaster aid before the federal government was ready to commit. Last October, the NBC 4 New York I-Team was preparing to publish a story questioning why FEMA committed $1.2 billion to rebuild NYU Medical Center -- a private hospital -- before committing similar cash to rebuild New York City's struggling public hospitals. According to the emails obtained by WNYC radio, Ram Raju, president of the city's Health and Hospitals Corporation, intended to sign a "mock" letter of undertaking known as LOU in regards to FEMA aid to four public city hospitals in order to pre-empt the I-Team report. “FYI. I believe that HHC will sign a mock LOU tonight in an attempt to stop the report from the NBC reporter,” wrote Chris Thomas, a FEMA advisor in the New York Sandy Recovery Office. It appears from the emails that both city and FEMA officials knew the agreement would carry no legal weight. “We are printing the letter up and having it signed on mocked up stationary. I am telling Dr. Raju that he will almost certainly have to sign the letter again,” wrote Jeremy Berman, an HHC lawyer. “Honestly they can sign whatever they want and say whatever they want. At the end of the day it very well might just be a piece of paper with ink on it, and I know they know that,” Thomas wrote. City Hall objected to any suggestion that the mocked up agreement was intended to scuttle a news story. “It was just impatience about getting through the bureaucracy,” Berman told the I-Team. 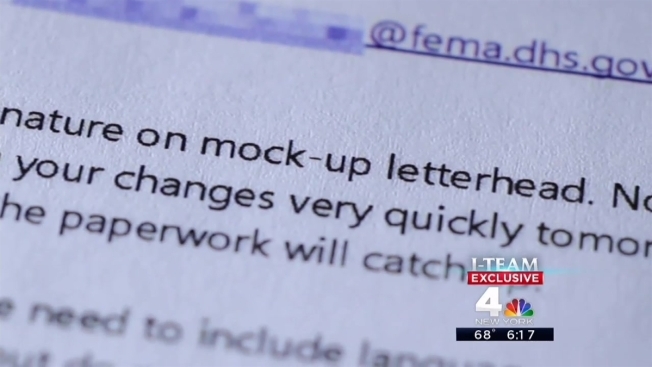 Berman told the I-Team the mocked-up letter was his idea to push FEMA to act faster in approving an official commitment letter. But from the beginning, it appears FEMA officials objected to the creation of a dummy commitment letter before an official deal was inked. “With all due respect, I advise against having a signature on mock-up letterhead,” wrote Thomas. On Nov. 6, 2014, Mayor de Blasio and Democratic Sen. Chuck Schumer held a news conference announcing $1.6 billion to repair and protect four of the city’s public hospitals: Bellevue Hospital, Coney Island Hospital, Metropolitan Hospital and Coler Hospital. But even as that press event unfolded, there was still no signed agreement with FEMA. Don Caetano, a FEMA spokesman, said FEMA representatives did not attend the news conference. City Hall declined the I-Team’s request to interview Raju, but in a statement emailed to the I-Team, the doctor said the additional five months between announcing the FEMA deal and signing it were used to negotiate more disaster cash for New York City. “While the original agreement announced with FEMA was for $1.6 billion, we continued to work with FEMA to grow the final grant to over $1.8 billion -- hundreds of millions more in additional funds that will further protect our public hospitals,” Raju wrote. Council Member Mark Treyger (D-Coney Island) applauded the additional funds, but said the FEMA emails raise serious questions about the priorities of government officials working on disaster aid applications and the timing of announcements. The city says public hospitals are in far better shape than they were immediately after Sandy. Three years later, equipment has been elevated and temporary flood barriers are ready to be assembled. But the city could not say whether permanent flood walls would be built at Bellevue and Coney Island hospitals in time for the 2016 hurricane season. Just a few blocks from Bellevue, a permanent flood wall has already been built around the new emergency center at NYU Medical Center. A permanent flood wall is currently under construction at the VA Harbor Medical Center. As a federal agency, the Veteran’s Administration went straight to Congress for funding and did not have to appeal to FEMA.